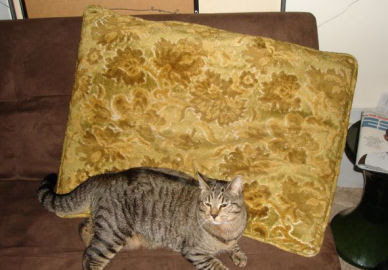 Design*Sponge: ugliest pillow contest: vote! 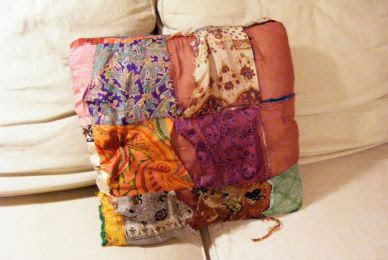 after a few days of wading through everyone's ugliest pillow entries i feel like i need to take a shower. i saw some serious nastyness and some downright ugly pillows (why so many puppy pillows?). the top 10 finalists are now going public with their hidden shame and it's up to you guys to vote for who you think is the WORST. the winner will receive two brand new thomas paul pillows (of their choice) to replace their ugly one, courtesy of pillows and throws. each finalist is below so check them out and leave your vote (please use the numbers provided) in the comment section below. voting will close on friday morning at 9 am and the winner will be announced that afternoon. thanks to everyone who entered! Wow! Those are HIDEOUS... but I say #3 takes the cake! it's so hard to chose, but #4 is pretty terrible. number one. could use a face-lift. #2-just don't think they could even be considered cute, kitchy or workable in any circumstance! They're all terrible, but #5 definitely takes the cake. number 5 for sure. those are awful!!! i vote for number 3. this contest was a fantastic idea...it's got me laughing!!! #3 definately whats with the yarn tassels? #8...no personality at all. 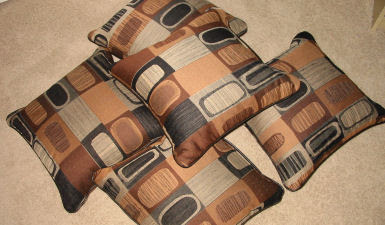 the other pillows are ugly as well, but #8 lacks cuteness or kitschiness. ugly AND boring! Oh my, god, #3 all the way... Phyllis, you poor thing! #3 - I'm with beckie. On its own it could be kind of cute/kitschy but the addition of those tassels.....just takes it to a whole other level. Urgh! 2. how gross. how bargain basement couch deal. oh wait, no i meant #3! the mushroom one. i thought that was #2, my bad! Whoever came up with #5 skipped cutesy-ugly and went straight to just-plain-ugly! Most definitely #3...Just to look at it makes me sneeze! It's really a toss-up between #5 and #2--if we are talking so ugly you can't even pretend it's cool ugly--I vote #5. #2...and there's so many of them. yuck yuck yuck. #1 has been beaten by a wildebeest... that's my vote. #3 -- I can smell the incense! #8 : is number 1 whole enough to be considered a pillow? why did this ever come into existence? #2... I agree with Heather- can't imagine any circumstances where these could be tastefully worked-in. #7 cause poodles on their own are pretty scary looking. #2 is my vote. I think #3 is cute and can be used in the right setting. I don't think there's anything you can do to #2 to salvage it. Will that fabric ever be "in" again? Number 3 is the winner in my book. #3 -- oh, that someone put so much effort into something so hideous. oh, yuck! they are all awful, in their own way. but i think #3 has to be the worst! ick! I'm going for #7 yuck! I'm not even sure #1 deserves to be called a "pillow". It gets my vote. How could anyone say anything but #5?! 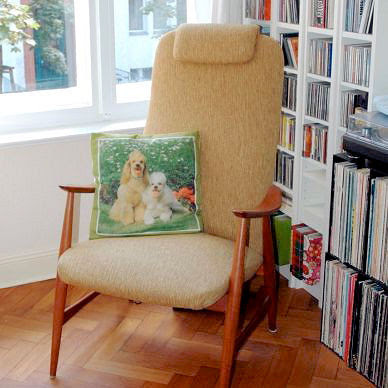 If I *had* to have these pillows on display in my house, #5 would be last on my list. #10 makes me want to puke! #3 - although it was tough to pick just one! Number 4 is the worst, by a neck, looks like that fake suede polyester stuff that gives me the hives, and they're ugly. Number three is cute ugly, and number one is worn out but once might have had ethnic charm. Number 5 is pretty bad two. But really the ugliest pillows I've seen lately are photo pillows on the Anthropologie website, sale section, shame on them. The horse and dogs are bad, but there are worse, and they still have a personal quirkiness potential about them. #2 - The rest can be seen as kitsch, and I actually like the naffness of the puppy and unicorn ones, but those are just nasty! Close call, and those poodles almost had me, but #3 has my vote. I would have BURNED IT years ago! 4 gives me the heebie-jeebies. they look...dirty. and not in a good way. 3 might be sort of fab if not for those insane tassels. If you removed the tassels, I'd kind of like #3. Come on, mushrooms are hot right now! Number 3 , definately !!! No. 3 is the worst. While No. 1 is the ugliest in my opinion, it's so bad that I just cannot believe someone would actually use it. Oh, #3 for sure. Um, is it terrible that I don't think #2 is all that bad? I just think they're... pillows. Not great, but not horrific. #6 - can't bear to even look at it. Great contest. Hats off to all the participants for being such good sports! #2. Besides being ugly, they are overstuffed and don't look comfy at all. Wow, #9 is U-GLEEEEEE, definitely the worst! I've got to go with #3! It makes me cringe! i vote #9. the other ones are all kinda cute (i love #5!) but #9 is the one that i would really hate to have in my house. #9 is definitely the ugliest! Hmmm, they are all pretty ugly, but I guess #9 is the worst. No.5. they look like they're smelly. I guess I'm not liking #9. No.5, hideous! Look like they could do with some Febreze too. #1 what exactly were you trying to do? #2 makes me absolutely cringe with 'bad showroom floor sofa - with pillows!' oh, so aweful. Some Girls make me happy. Some Girls make me smile. But the Girl in #9 DOES NOT CUT IT. #2, and by a long shot. 3, 4, 6, 7, and 10 are just awful taste, but they don't cause me physical pain to look at like #2. 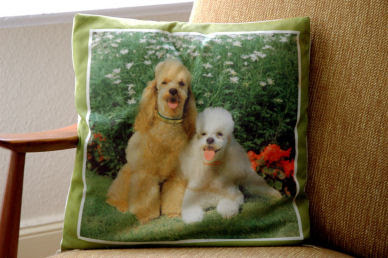 #7, because not only is the pillow ugly, but the dogs are ugly too! I've never seen poodles with facial expressions like that. #2. I just can't stand the stupid graphics on them. i vote for #9 because i really, really, really hate it. #9 rubs me the wrong way for sure. Ahahaha! I have laughed hard at these. I think the photo image pillows with the white horse and poodles are actually rather kitschy fun though. The shredded thing, #1, is my vote. no. 9 offends me on so many levels. #8...U-G-L-Y, you ain't got no alibi--you UGLY! #2- wow. that is bad. I just don't know, some are skimming the border between hid-ge and kitsch so closely, but I think for me there's no double about #3! Take the tassels off # 3 and it's not so bad... but #9 has no hope of redemption! #10! Put those poor puppies out of their misery! #3 - gives me shivers! definitely #8... to torture that poor cat like that! time to call the humane society! #8 The colors are AWESOMELY awful! #2 - what kind of maniac buys FIVE of that cushion? Black and brown is my most hated colour combination. Ick. I vote for number 3. #4. There's not even any artistic effort there, like at all. In fact, they're so bad I'm not sure this person deserves to have nice pillows. It's a toss-up between #5 and #8...but I'm gonna have to say #5. Those are not only ugly, they're yucky. Yucky, I said. Blech. I have to go with #5! I vote for the dirty little # 5's. all pretty gross... but #4... i wouldn't go near that. number 8!!! gross. cat is cute though. And #1 should just be thrown away. 9 because it's just in very bad taste. 1 should just be thrown away.